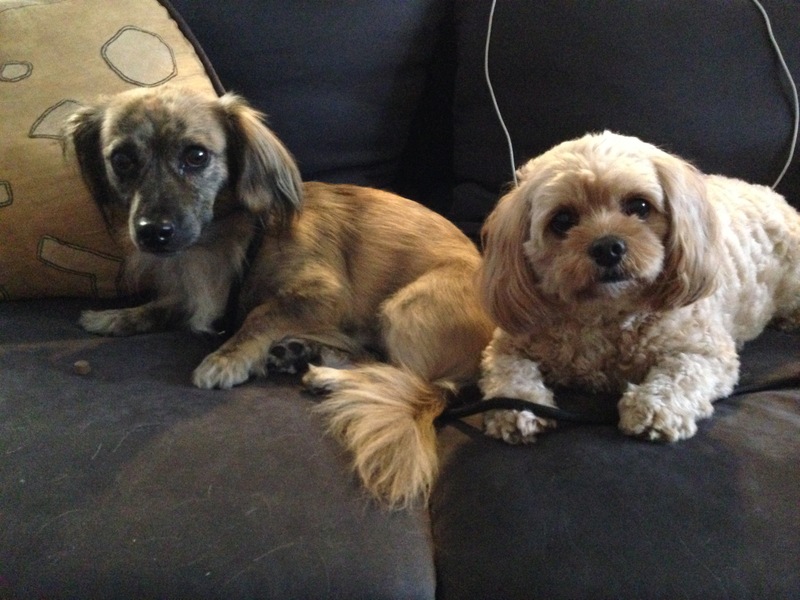 Posey (right) is a three-year-old Cavalier King Charles Poodle Mix who sometimes gets possessive over objects and likes to take them from her room mate Harry(left), a one-year-old Dachshund / King Charles Cavalier mix who was adopted earlier this year. Harry has low self esteem and is sometimes aggressively possessive when anyone approaches him while on his guardian’s lap. Both dogs needed work, but most of what I helped with Harry was hard to capture on film. He was very uncomfortable, showing poor hunched over posture to attempt make himself smaller. He didn’t move much, had dilated pupils, ears back, head lowered and had to be helped with some gentle tugs on the leash at first to get him moving around. I spent the first 15 minutes discussing him with his guardian while simultaneously trying to get him to start moving around. I used some treats with a strong aroma to try to tap into his nose. At first he was so anxious that he wouldn’t take any so I adopted some softer body language and made them easy for him to get. After a little coaxing, I was able to get him to take one placed on the floor right in front of him. I followed that up with another a few inches away. To get this treat Harry had to take a step forward. After that I kept placing he treats slightly farther away to get him to gradually walk a few feet away from his kennel. Harry’s guardian did a lot of work with him, telling me he was almost completely shut down when she first got him. It takes a lot of love and patience to adopt a dog like that and nurture it enough to help it start to live again. While she made some great progress in getting he dog to open up, she continued to have difficulty when in the apartment. After discussing it longer, I think that the approach that helped the dog learn to come out of his shell had now started to hinder the dog’s progress. Doting on the dog allowed it to stop growing and advancing. Over loving the dog when in the wrong frame of mind also helped reinforce the exact behaviors (fear and insecurity) that she was trying to overcome. When I found out that the dog was almost “normal” on walks and in different locations, I know that we needed to start making some small changes to how his guardian communicated and interacted with him. By getting the dog to literally follow her, petting him for a purpose and teaching him a new command and correction each week for the rest of the summer, she can help Harry gain back some confidence and learn to be a normal dog at home. While Harry’s issues were far deeper and on the more psychological side, Posey had a number of issues as well. Hers were more assertive or active. She humped Harry, took his toys, demanded attention from her guardian and was under the impression she was in charge. While the goal with Harry was to increase his confidence and help him grow, I knew I needed to change the leader follower relationship for Posey. I started out by showing her guardian how to teach the dog to lay down. I call this command crash and Posey picked it up immediately. It didn’t take this long to master the crash exercise. With a little extra practice the dog was doing it on command and without using a treat. Next I showed her guardian how to get the dog to keep a reasonable distance and respect her personal space. By introducing a small bubble of personal space, we can help the dog see and identify her guardian in more of an authoritative light. Posey liked to take things and hide under furniture, not necessarily at the same time. But it happened so often that I wanted to give her guardian the ability to help the dog learn to enjoy being out in the open with the other members of the family. I tossed a high value treat into one of the two doggie beds and then started repeating the command when Posey picked it up. By introducing the command word at the exact moment the dog tastes it and repeating the word while she chews, we can condition her to eventually go to the bed on command. There are other two ways to conduct this exercise is done; place a teat in the dog bed when the dog is away, then observe and wait for the dog to discover it on its own. When she does, her guardian can repeat the command word over and over as she chews it. The other way to condition the dog it to offer a treat, then lead the dog over into the bed and giving it to her while repeating the command word. Towards the end of the session, I showed her guardian and leadership exercise I developed to help a dog learn to; focus, calm themselves down, see the guardian as an authority figure and restrain themselves rather than reacting instinctively. The exercise also helps the guardian learn how to establish and enforce boundaries in a way the dog understands and respects. It didn’t take long for Posey to figure out how to run through the exercise. Once I was sure she had it down, I walked her guardian through it with equal success. This was an interesting session; two dogs with very different issues. It will be important for Harry’s guardian stop catering to him and engage him in activities and motivating exercises that help the dog literally move forward. The more the dog walks around and uses his nose, the more “dog” he will become inside the apartment. By the end of the session, Harry was carrying his head higher, his pupils were normal, his ears forward and he didn’t look so stiff. When his dog walker from Pupperton’s arrived, it was great to see some energy and excitement from him. By making small changes to many of her daily interactions with Harry, his guardian will help the dog regain his confidence and put him in a much better place. Posey learned the crash and leadership exercise so quickly, her rehabilitation should be much easier. Her guardian will need to continue to respond with good timing when the dog breaks any of the new rules or boundaries. Combined with repeated delivery of positive reinforcement of wanted actions or behaviors, she will help the dog learn to self identify as a follower. The more the dog sees itself that way, the less it will engage in unwanted actions or behaviors.